Playstation Network Prepaid kaart, €50 om te gebruiken bij de Online service van PlayStation Network. If you like making purchases in the Playstation Network Store, it is very handy if you have a big sum of credit on your account. with the Playstation Network Card 50 Euro Belgium, you can deposit a big amount onto your account at once. 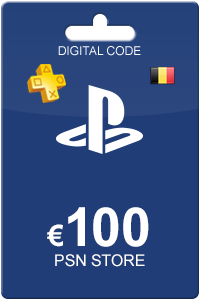 Take notice: this code is only valid if you have a BelgiumPlaystation Network account. With the Playstation Network cards you can deposit various values onto your accounts. The cards can be used with a PSP, PS3, PS4 or PS Vita. You can purchase various kinds of content in the Sony Entertainment Network Store and the Playstation Store. The offer of these stores is huge, and you will find movies, games, music, avatars and extra content, among others. Due to these cards, you no longer have to pay with a credit card! Download the content right away to start enjoying what you love most. 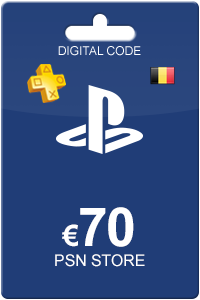 We offer various Playstation Network Cards valid for Belgium accounts. Besides the Playstation Network Card 50 Euro BE, we also offer cards with other values so that you can select the right amount you wish to deposit. Ordering a Playstation Network card is easy. You fill in your personal information and pay your preferred payment method. Afterwards, the code will appear on your screen and is sent to your email. The code can be redeemed on your console or via web and you can start purchasing immediately! How to buy Playstation Network Card 50 Euro BE? Livecards.co.uk makes buying PSN Card 50 Euro BE as easy as pie! All you need to do is fill in your email address, pick a payment method, complete the payment and voila! The code is yours.